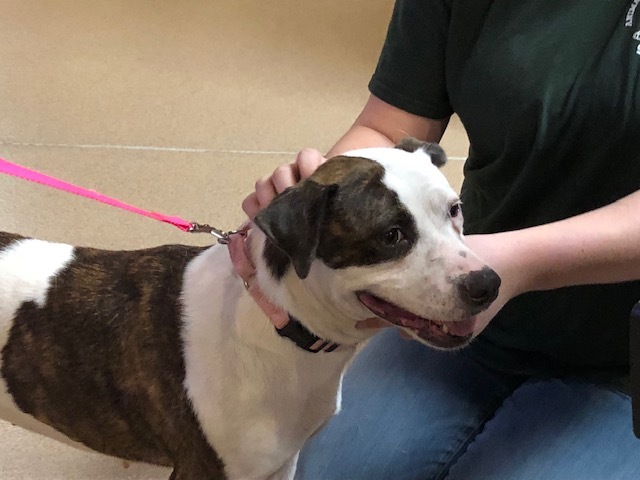 ZANESVILLE, Ohio – The Animal Shelter Society is introducing another furry friend looking for their forever home. Meet Holly. She is a 4 years old American Staffy mix. She weighs 43 pounds and possesses the friendliest personality. Holly is already spayed, microchipped, and updated on all her shots. With dogs like Holly, it’s important to see how well they interact with other animals, and Assistant Director of the Animal Shelter Society, Russell Denny, said families should bring their current pets to the shelter to meet. “When someone wants to adopt Holly or any of our other dogs, if they have other animals at home, dogs. We recommend a meet and greet where you bring your dog from home in. And we just see how they interact,” he said. The Animal Shelter Society also wanted to remind everyone of the third annual Dog ‘N’ Jog 5K run and walk at Zane State College. The 5K takes place tomorrow where participants are encouraged to bring their furry pals and help support the animal shelter. “We rely on the community for everything we do here from our lights being on to the animal’s care. Without the community we would not be here, and this is just another great event. Zane State has really been a big supporter and we’re really appreciative,” Denny said. To learn more about Holly you can visit her at the Animal Shelter Society, she has a sponsor adoption fee of $110.